He's also close friends with a Rottweiler and some poodles. 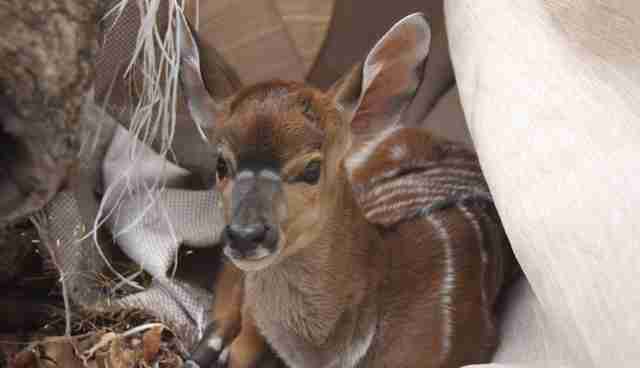 A woman noticed a baby antelope cowering underneath a bush. At first, she left him alone, thinking his mother would come back. Lions roared nearby, and the woman worried the baby wouldn't last long. She decided to contact Daktari, a wildlife orphanage run by Michele and Ian Merrifield in Hoedspruit, South Africa. 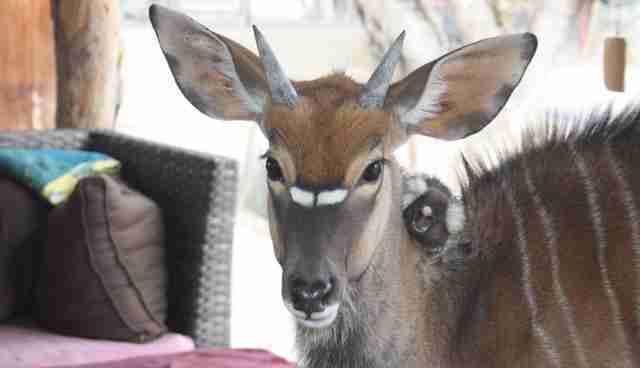 The Merrifields advised the woman to watch the antelope for one more day, just in case the mother did return. 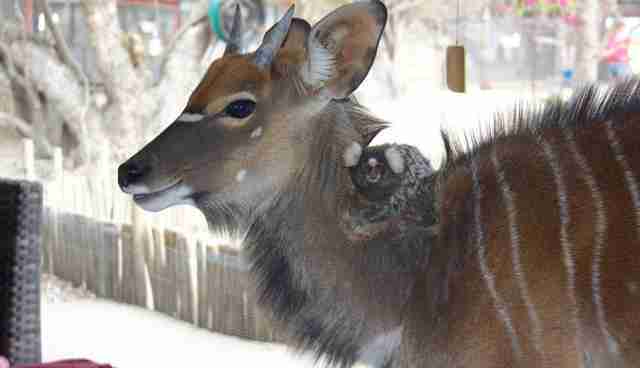 Antelope moms often hide their young while they feed, but they usually come back. By the end of the next day, however, the mother still hadn't returned - she'd probably been eaten by lions. "He was very weak when we got there," Ian told The Dodo. "We made the decision to catch him, and it was very easy - he didn't even struggle." 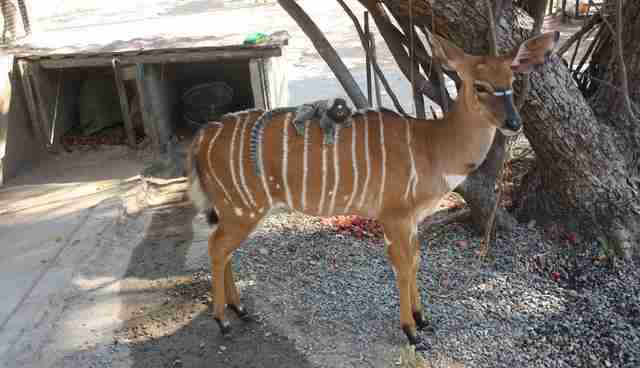 The baby antelope was actually a nyala, an ungulate with white vertical stripes and spots on its flanks. 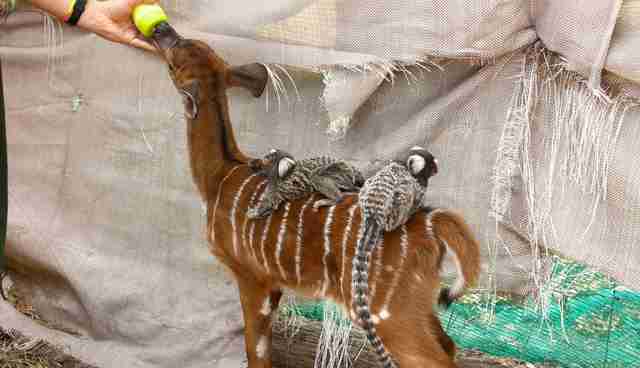 According to Ian, nyalas are very shy, and they can be difficult to feed, so they worried about the baby's chances of surviving. 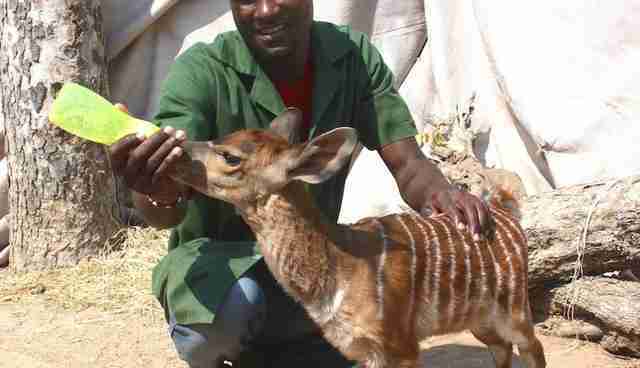 To feed a baby nyala, you need to make a special formula that combines cow's milk, egg yolk, cream and a digestive bacteria called protexin. 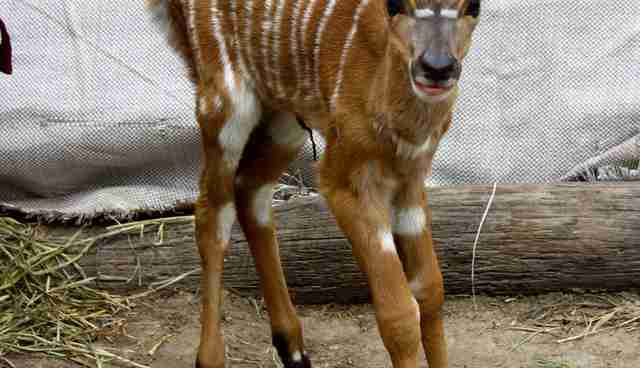 Then the nyala needs to weighed and fed exactly twenty percent of his bodyweight in formula. To make matters more complicated, the formula needs to be exactly 100.4 degrees Fahrenheit. 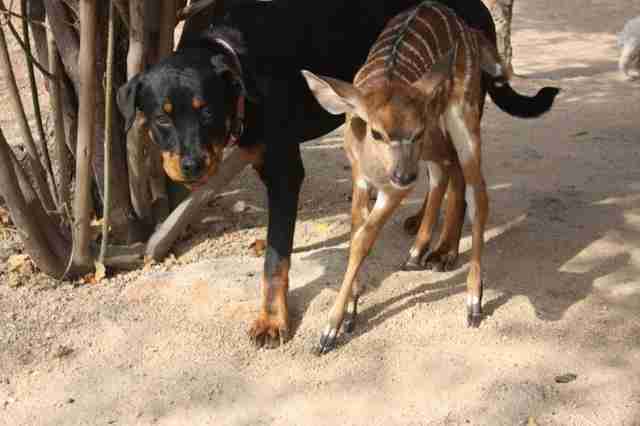 Otherwise, the nyala's sensitive digestive system will reject the formula, and it could end up in the rumen, the nyala's first stomach that isn't functional yet. 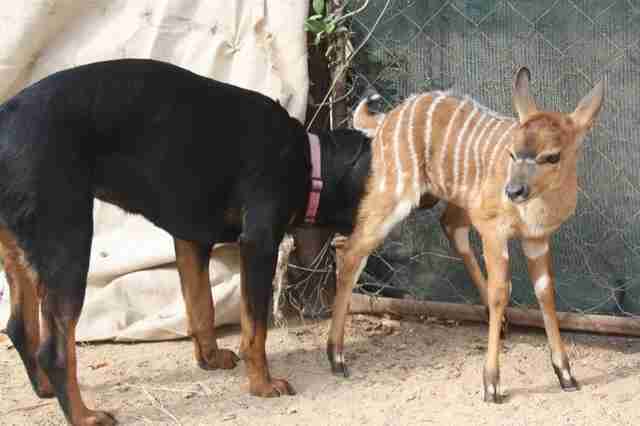 Inside the undeveloped rumen, the formula could ferment and ultimately kill the nyala. Besides needing formula at exactly the right temperature, the baby also has to be fed every three hours, even throughout the night. 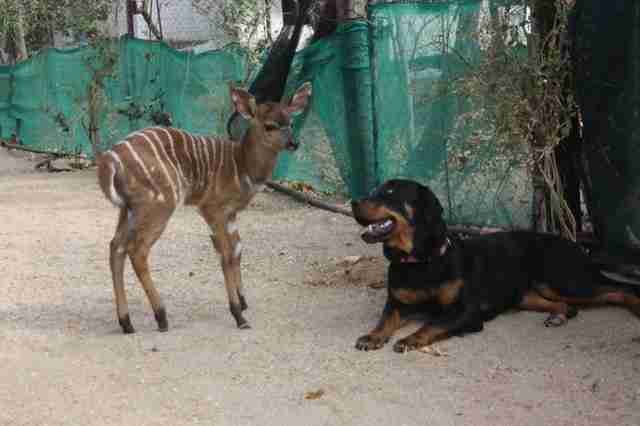 The nyala - whom the Merrifields named Chancy - turned out to be an excellent eater, and he grew strong and healthy. After a few days, Michele and Ian allowed the other animals at Daktari to interact with Chancy. Turns out, everyone wanted to be Chancy's friend. ... and she clearly adored him. Nikita also took on a motherly role by licking Chancy's backside, which is what Chancy's mother would have done in the wild to remind him to "do his business." The Merrifields' three white maltese poodles, Candy, Bouba and Gucci, also loved Chancy. They lay outside Chancy's feeding enclosure until Michele started letting them in. But it was the marmosets, Thor and Leila, who adored Chancy the most. The Merrifields had rescued the marmosets from an elderly lady who had kept them as pets and had recently passed away. Marmosets actually originate from Central and South America, a long way from South Africa where they now live. 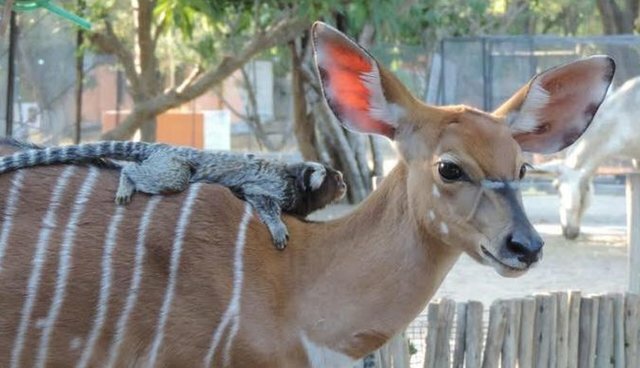 The Merrifieldscertainly don't condone keeping wildlife as pets, but keeping the marmosets at Daktari was the best solution they could find for an unfortunate situation. "The marmosets would visit Chancy in his feeding cage and watch what Michele was doing," Ian said. "I think they were curious, and they didn't seem afraid of him." Then one day, Michele and Ian saw the marmosets on Chancy's back! 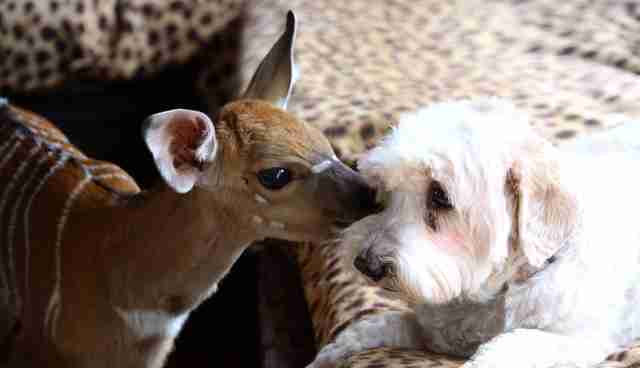 "Chancy really didn't seem to care, and possibly even liked them tickling his fur when they sat there," Ian said. When Leila died, Thor became even more attached to Chancy. In fact, he became - and still is - Chancy's constant companion. After about five months, Chancy was weaned and started eating solid food, and the Merrifields started allowing him to come and go as he pleased. 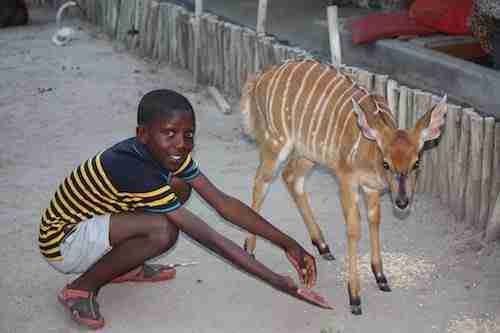 "He formed a bond with a female bushbuck we had also raised," said Ian. 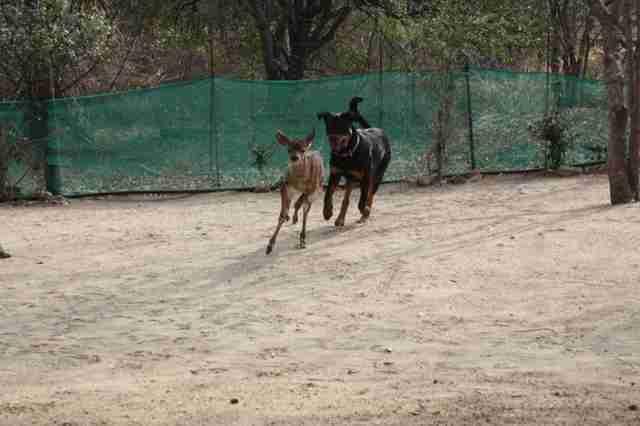 "The bushbuck kept coming back to camp for food, as we've been through a prolonged drought and life is tough out in the bush. Chancy accompanied her wherever she went." 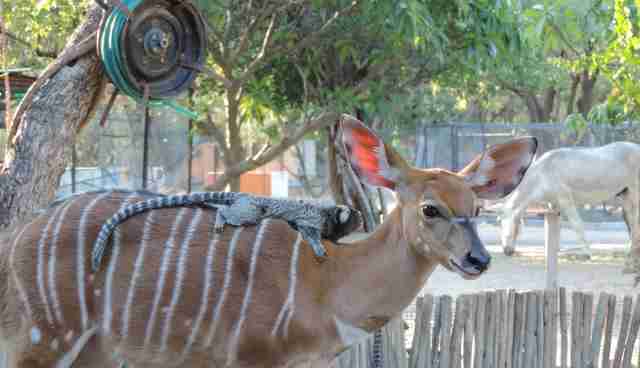 Chancy is nearly grown up now, but he still visits Daktari every day ... although he doesn't always say hello to his old friends. 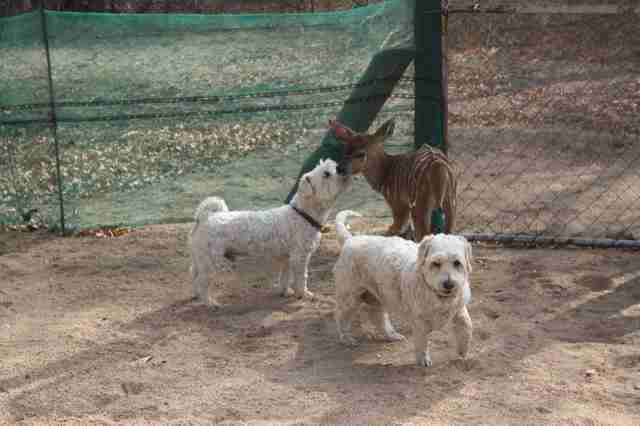 "He's greeted by the dogs and he doesn't mind at all, but he actually ignores them now," said Ian. "It think Chancy believes he's higher up in the order of life and is a bit aloof!" 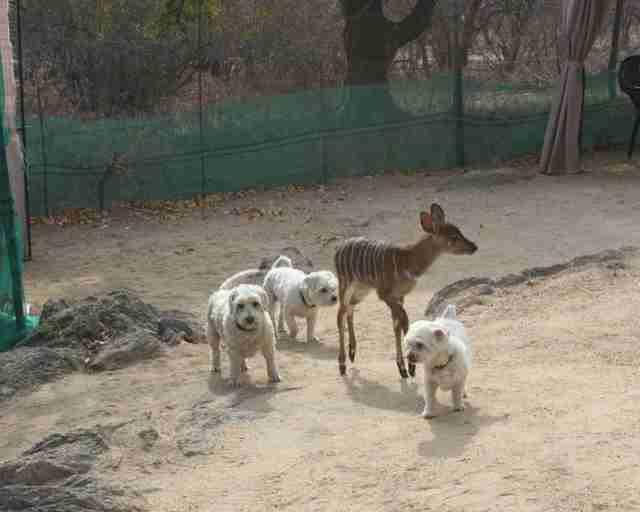 Chancy hasn't even paid attention to Daktari's latest rescue - a young female nyala - but Ian thinks this will change when Chancy realizes how pretty she is. ... and Chancy seems to love spending time with his friend. To help Daktari run their bush school and wildlife orphanage in South Africa, you can donate here. You can also get more involved with Daktari by volunteering as a caretaker and teacher. Find more information about Daktari's volunteer program here.